The American anthropologist Loren Eiseley said that if magic can be found on this planet, it is found in water. It’s no surprise that we use water to enrich the aesthetics of our lives and add value to our property. 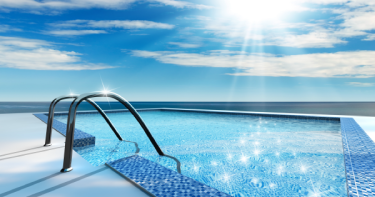 In this blog, the experts at our tile store in Anaheim will go over the best tile materials to use for your pool or fountain. While tile’s role in pools began solely at the water line, it has grown both inward and out, and developed into the choice between the fanciful mosaics of glass and porcelain and the natural beauty of stone. Granite is an enduring stone and a very dense one. It contains a glittery quality whose source lies in the bond of feldspar and quartz crystals. A few different colors are available, and it will never fade beneath the harsh exposure of the sun’s rays. Granite’s porous nature means it is a cool and safe surface for walking on barefoot around pools. While porcelain tiles can be patterned after granite and other stones, its true beauty shines when it is used to display more distinctive art. The choices are endless with color and designs, but the critical factor in selecting this materials is the advantages of not absorbing heat and being less brittle than stone. And slip resistant porcelain pavers are best option for the pool area, they have a very low porosity that helps to facilitate faster draining and drying. A sedimentary stone formed in shallow, warm marine waters, limestone often has the visual interest of fossil fragments or bands of contrasting color. It is made up of coral, shells, and calcium carbonate. We have used limestone in construction since ancient times. The variety of colors combined with the uniqueness of its fossilized pattern is visually appealing when used with water outdoors. It is, however, more sensitive to the wearing of colder climates with their greater threat of freezing. Glass tiles are durable and excellent for use in and around water. The fact that they do not suffer moisture absorption means they avoid such undesirable effects as mildews and molds. When utilized in fountains and pools, they add splashes of color and texture that does not deteriorate or fade with time and the sun. Glass tiles are safe for use in areas that experience winters that plummet below freezing. As versatile as porcelain is, it is hard-pressed to compete with the glittering, reflective, refractive qualities of glass when it comes to mosaics. Glass does have grout and adhesive as its Achilles’ heels; lesser quality at installation time will result in a shorter lifespan of patterns and placements. Travertine is a type of limestone. It is a porous sedimentary rock, cream in color, also formed by deposits of calcium carbonate; more porous than is base limestone, in fact, giving it greater safety against slips. It has a timeless elegance as another example of age-old building materials. Usually available in beige tones, Travertine tiles can be attained in an aged finish. Unfortunately, this material shares its weakness with limestone in that freezing temperatures have ill effects on its lifespan. Whether uniting water with stone, glass, or porcelain, remember to enjoy the loveliness and liveliness of a fountain or pool tiled in individual preference and lasting beauty.